Scary noises from storms or even Fourth of July fireworks can turn the bravest canines into scared puppies. Even fireworks noises for New Years, cars backfiring or gunshots during hunting season also create dog fear and happen throughout the year. Up to 20 percent of dogs suffer from noise phobias. For fireworks celebrations, owners can predict events and take steps to soothe upset doggy feelings. But unexpected storms can be difficult to manage. Frantic pups pull down window blinds, collide with screen doors or crash through windows, while others simply shiver and moan. It's important to puppy proof your home so the frightened pup isn't injured, and a secure fence should withstand even a puppy panic attack. Behaviorists recommend pups be counter-conditioned to the scary noises by exposing the fearful dog to recorded sounds of the scary noise played at a very low volume and rewarding him for staying calm. Gradually increase the noise level to help the pup “get used” to the noise. Desensitization programs can take weeks and sometimes months to work, though. Pups suffering from storm phobias also may react to the sounds of rain. Even the sensation of humidity or barometric pressure can trigger behavior problems, and you can’t do much to control humidity or barometric pressure. Use these 11 tips to dial down the noise fear factor. 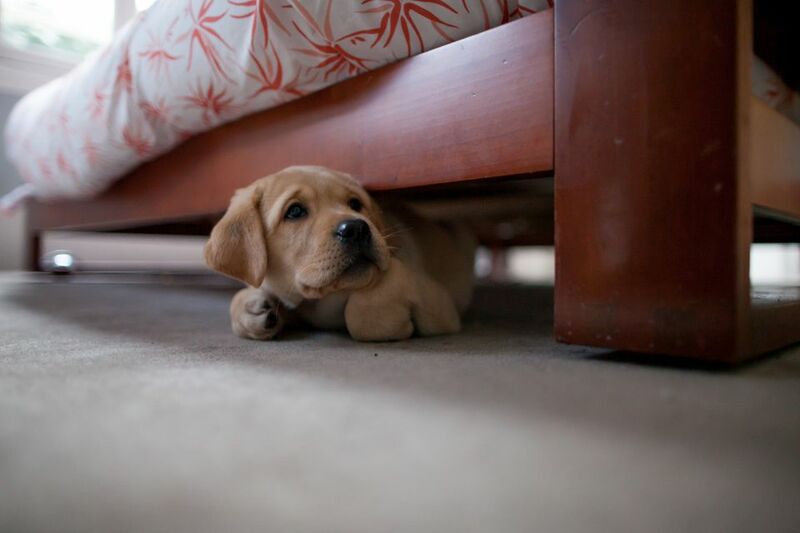 Fearful dogs may instinctively look for tight-fitting places where they can hide. They often squeeze between furniture and the wall or hide their eyes in your armpit. This applies a comfortable "hug" sensation that seems to calm a dog, so let your pup seek his own shelter. Avoid offering sympathy. Coddling your pup when he's fearful can reward the behavior. Instead of saying, "poor baby are you scared?" use a matter of fact tone, "wow, that was a loud noise and made me jump, too—but we aren't scared." Dress them up. Some puppies and older dogs too benefit from a wrap that goes around your dog's body with just enough pressure to give him the sense that he is safe and protected. These aids are sold under a variety of names and at a number of price points. Avoid giving your puppy a sedative, because it won't reduce his fear. He just won't be able to do anything about it, which can make his anxiety even worse. Your vet may prescribe anti-anxiety medication based on your individual pup's needs. Ear protection and earplugs that mask the sound may also help. Ask your vet to show you how to safely place anything in the dog's ears, though, so you don't damage the pup's hearing. Aromatherapy also helps soothe puppy fears. Some products are designed to soothe dogs prone to distress brought on by thunderstorms, fireworks, and other noisy or anxiety-producing situations. A natural supplement of melatonin, a substance similar to the chemical in your dog's brain that helps regulate sleep, may help. Melatonin helps reduce the panic attacks in noise-phobic dogs, but it won't sedate the pup. Melatonin lasts several hours and may be cumulative over several days so you can plan ahead for known scary events such as July Fourth. Melatonin can be found in health food stores, pharmacies, and some supermarkets. Always check with your veterinarian for the proper dosage for your size and breed of dog. Another option includes dog appeasing pheromone products. These products, available in plug-in sprays, and infused collars can be found at pet products stores. The pheromones help a dog put a damper on fear long enough to “think” so that your behavior modification/training techniques can work. Dogs can’t panic when using their brain for something else such as “work” so give your dog a job to do just before and during a thunderstorm. Drill him on obedience commands and special tricks, or ask him to play fetch and carry around a favorite toy. That engages his brain into productive activity rather than thinking about the scary noises. Giving him treats and positive rewards for remaining calm also reinforces the benefits of controlling his emotions. Each time the wind blows, or thunder booms, try saying, "Wow, what fun!" to jolly him along and show there's no reason to fear, and then give a treat. Turn a radio to static to create white noise that muffles scary noises. Certain types of music can prove calming, too, by “entraining” the dog’s heart, respiration, and brain waves to slow down and match the soothing rhythm. Harp music can be especially calming.